What are the ways in which we can understand the meaning of the psychology of meaning in people’s lives? In the last century mainstream psychology has largely neglected the topic of meaning. More recently, the concept has become an academically legitimate one within positive psychology and in some other speciality areas of psychology. This book contains a collection of theoretical, methodological and empirical papers written by the acknowledged experts systematically working on the problems of personal meaning within the positive psychology framework. The authors investigate the possibilities and limitations of a scientific study of personal meaning and new perspectives that this concept brings to the field. This book was originally published as a special issue of The Journal of Positive Psychology. Dmitry Leontiev, Ph.D., Dr.Sc., is head of the International research lab of positive psychology of personality and motivation at the Higher School of Economics in Moscow, Russia. He is also Professor of Psychology at Lomonosov Moscow State University in Russia. 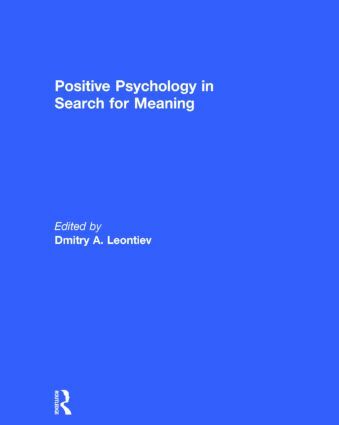 Professor Leontiev has numerous publications in the psychology of personality and motivation and meaning. He won the Promotional Award of the Victor Frankl Foundation in 2004 and was distinguished in 2014 as an Honorary member of the Society of Logotherapy and existential analysis of Viktor Frankl Institute, Vienna.